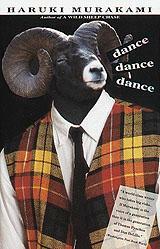 Book review: "Dance Dance Dance"
This review first appeared in THE BRIDGE Illustrated in 1994. Japenese modernist writer Haruki Murakami's "Dance Dance Dance" takes on the standard literary issue  an individual searching for his place in the world, struggling to understand the forces that shape him  and applies it to contemporary fears, looking at the faceless capitalist system that pressures all of us to conform. The narrator in "Dance Dance Dance" has no family, works as a free-lance writer, has no social life  in short, has none of the connections to others that normally bind us to society. His marriage has just ended, he hasn't worked in months  and into this life devoid of reference points come disturbing dreams of a shabby hotel he'd once stayed at with a former girlfriend. When the protagonist returns to the site of his dark dreams  dreams in which his girlfriend is crying for him, dreams featuring a mythical "Sheep Man" oracle  he finds the former dump replaced by a shining high-rise hotel, but with the same name. After he checks into the Dolphin Hotel, the barrier between what's real and what isn't begins to dissipate when an elevator deposits him into the old hotel  into his dreams. As the narrator explores what is happening to him, he is reminded again and again that he does not fit into modern life, that he stands out from the norm. Oddly, it's a 13-year-old psychic, Yuki, who provides the narrator's strongest connection to solid reality. Ultimately, the protagonist comes face to face with this question: Can we overcome the weirdness in our lives, and create normalcy out of chaos and confusion? No need to spoil the conclusion  in retrospect, it isn't nearly as important as the question itself.